Search Minerals announces three new… | Search Minerals Inc.
TORONTO, June 20, 2013 /CNW/ - Search Minerals Inc. (“Search” or the “Company”) (TSXV: SMY) and its wholly-owned subsidiary, Alterra Resources Inc. (“Alterra”), are pleased to announce the discovery of three new prospects in the Port Hope Simpson Rare Earth Element (“REE”) District in SE Labrador, with mineralization similar to that at the Company’s Foxtrot Project (“Foxtrot”) (the Company’s revised Preliminary Economic Assessment (“PEA”) for the Foxtrot Project has been filed on SEDAR and is available at www.sedar.com and on the Company’s website). The new Prospects, Fleet Fox, Fox Run and Silver Fox, along with the two previously announced Foxtrot-like Prospects, Fox Pond and Foxy Lady, all occur within 10 km of the Foxtrot REE Deposit. Search is targeting these five Prospects, as well as additional targets with similar geophysical signatures and geology, as exploration targets for the 2013 field season. Fleet Fox and Fox Run, along with previously announced Fox Pond and Foxy Lady, exhibit Foxtrot-like REE mineralization, grades and host rocks; Silver Fox contains lower heavy REE (“HREE”) and higher light REE (“LREE”) than Foxtrot. 215 ppm Dy (247 ppm Dy2O3), 1104 ppm Y (1402 ppm Y2O3) and 1714 ppm Nd (1995 ppm Nd2O3) over 5.08m at Fox Run. The Foxtrot-like district-wide REE mineralization consists of the Foxtrot Deposit, five Foxtrot-like prospects and additional Foxtrot-like targets that occur in a 25 km-long felsic volcanic belt. Exploration in the Fox Harbour Volcanic Belt for Foxtrot-like mineralization has been ongoing since 2010. Channel sample results are presented from three new Foxtrot-like prospects: Fleet Fox, Fox Run and Silver Fox. These prospects exhibit REE mineralization consisting of allanite, zircon and fergusonite, associated with felsic volcanic rocks in a mafic-felsic bi-modal volcanic belt. Fleet Fox and Fox Run channels give REE analyses similar to the REE resource at Foxtrot (Table 1). Fleet Fox channel samples give average values of 220 ppm Dy (252 ppm Dy2O3), 1158 ppm Y (1471 ppm Y2O3) and 1710 ppm Nd (1995 ppm Nd2O3) over 3.64m. Fox Run channels give average values of 215 ppm Dy (247 ppm Dy2O3), 1104 ppm Y (1402 ppm Y2O3) and 1714 ppm Nd (1995 ppm Nd2O3) over 5.08m. Silver Fox mineralization exhibits higher LREE (up to 9593 ppm total LREE; compare to Table 1), lower HREE (up to 525 ppm total HREE) and much higher Zr (up to 30,381 ppm Zr) than Foxtrot. Lower values of the more valuable HREE (e.g., Dy from 100-125 ppm and Tb from 20-25 ppm), compared to Foxtrot, indicate that Silver Fox is a lower-priority HREE target. There are now four prospects (Fox Pond, Foxy Lady, Fleet Fox and Fox Run) that exhibit Foxtrot-like grades (Table 1) over minimum true thicknesses of 3-5m. The Foxtrot High Grade Core (“HGC”) resource occurs over a strike length of 500m and a true thickness of 3-25m. Strike lengths at the four Foxtrot-like Prospects range up to 800m. Fox Pond and Foxy Lady are drill-ready targets, whereas Fleet Fox and Fox Run will require additional exploration work before drilling. Exploration work in the Fox Harbour volcanic belt indicates that the belt is continuous over at least 25 km. At least four additional, unexplored targets, with similar geology and geophysical signatures occur within this belt. Preliminary exploration work and data interpretation indicate that the Fox Harbour volcanic belt and associated REE mineralization sporadically occurs over an additional 25 km, for a potential total belt length of at least 50 km. There are currently three identified sub-belts, with felsic volcanic-hosted REE mineralization, in the well-known portion of the Fox Harbour volcanic belt. Foxtrot, Fox Run and Silver Fox occur in the same sub-belt (Mt Belt). Foxy Lady, Fox Pond and Fleet Fox, along with most of the unexplored targets occur in a nearby sub-belt (Road Belt). The third belt contains abundant low grade REE mineralization but no significant targets to date. 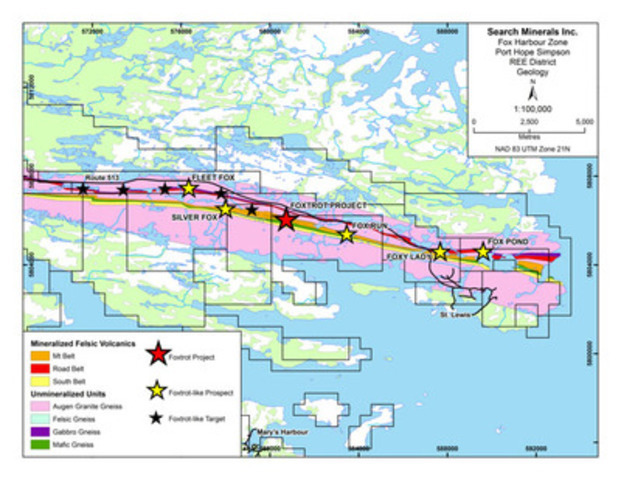 Search is planning an exploration program for the 2013 field season to map and sample Foxtrot-like mineralization throughout the Fox Harbour volcanic belt (targets and prospects mentioned above) and to prioritize targets for a small exploration drilling program. The aim of this program is to discover/document additional Foxtrot-like deposits in close proximity to the Foxtrot Deposit and to add to the Foxtrot resource; currently 9.3 million tonnes indicated at 189 ppm Dy and 5.2 million tonnes inferred at 176 ppm Dy (see Nov. 1, 2012 news release, “Search Minerals Phase III Drilling Increases Foxtrot REE Project Resource Estimate by 55% of Similar Grade”). Dr. Randy Miller, Ph.D., P.Geo, is the Company’s Vice President, Exploration and Qualified Person for the purposes of NI 43-101. Dr. Miller has reviewed and approved the technical disclosure contained in this news release as applicable. The Company will endeavor to meet high standards of integrity, transparency and consistency in reporting technical content, including geological and assay (e.g. REE) data.